Tired of playing poker at home on your PC or laptop? Want to see who is really hiding behind the avatars on your screen? Well now is your chance to do just that. Virtual poker room PKR is giving all its members a chance to experience the buzz of playing live at the Fox Poker Club next month, in a series of events which they are calling `PKR Social`. The first `PKR Social` starts in a few days time in Manchester, at the MEN Arena, where 100 lucky players will attend an evening of drinks and entertainment which includes martial arts. The Fox Poker Club is in Shaftesbury Avenue, London and only opened late last year and has already 10,000 members. Qualifiers are already running for players to gain a seat at the event, which has drawn inspiration from the already popular PKR live events. For as little as $1.88 a seat could be yours through a PKR Social lotto which run on Mondays, Wednesdays, Fridays and Sundays or for the more experienced players a Social satellite at $17.85 is available, again on the same days. The main event starts on Friday 25th March with sit & go tournaments being held, as well as numerous other games, and on the Saturday there will be the main event 150 seat tournament with a $100 buy-in. There will be numerous side games taking place as well. 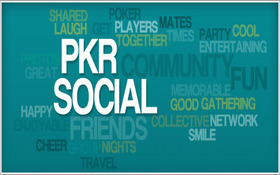 Social events have been held before but nothing like the events being offered by PKR. These events will be held on a regular basis but they will not be restricted to just poker. There are golf days being planned, pub quizzes and even pool tournaments and it will give all members the chance to meet other players, socialise and make new friends, but not just at poker. If you are not already a member it is quick and easy to join. Just visit www.pkr.com to download the free software and your chance to play at London’s only fully licensed poker club. This entry was posted on Tuesday, February 22nd, 2011 at 3:06 pm and is filed under Poker News. You can follow any responses to this entry through the RSS 2.0 feed. You can leave a response, or trackback from your own site.